Flying into an event that was already bound to be known as his own "Thrilla in Manila" – for you non-boxing fans, the moniker given 1975's Ali-Frazier III – it was eerily fitting that the Pope started the spectacle with some fightin' words. Yet even before terming climate change as man's having "slapped nature in the face" and compared incendiary reactions to hate speech to the expectation of a punch from him if somebody "says a bad word about my mother" during an unexpected 50-minute, eight-question presser (English transcript) on the six-hour trip from Sri Lanka, Francis' latest bout with the media began with a stunning left hook: his unprompted announcement that, "God willing, I will do the canonization of Blessed Junipero Serra in the United States" during his late September visit. As the Serra announcement came in the context of the pontiff's decision to raise Blessed Joseph Vaz as Sri Lanka's first saint without the requisite miracle, the Pope replied that his move to confer "equipollent" canonization on a handful of blesseds revered over the course of many centuries was made as each "did great evangelization, and so they are in accord with the theology of Evangelii Gaudium." Speaking of the governing manifesto that underpins everything in this pontificate, another of its truths similarly bears recalling: the biggest ecclesial victor of Evangelii Gaudium was no global north elite that confuses evangelization with its political causes, but the dynamic missionary witness of an Asian church wedded to the struggles of its people, a place whose vision echoes the Incarnation in employing its own culture for the spread of the Gospel. As the president of the Filipino bench memorably put it in the most loaded speech at the 2012 Synod, "our experience in the Third World tells me that the Gospel can be preached to empty stomachs but only if the stomach of the preacher is as empty as his parishioners." 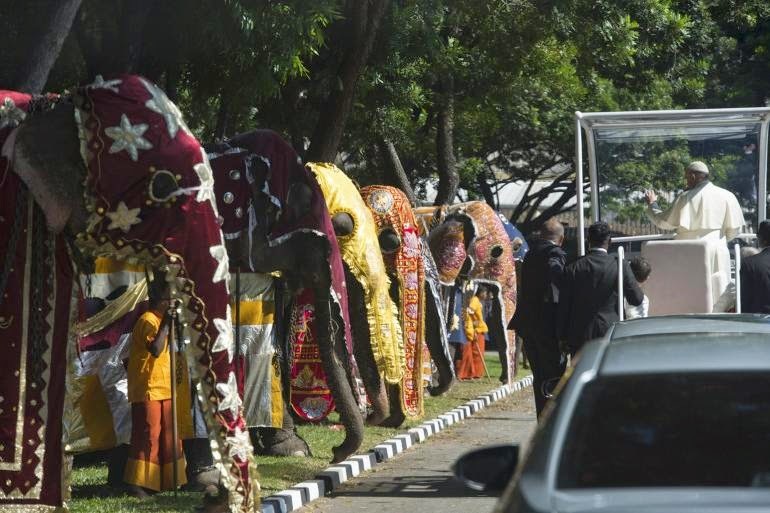 While this weeklong trip's Sri Lanka leg provided a shot in the arm to interfaith relations and a minority church's ability to serve as a "bridge" of reconciliation between warring ethnic groups, in the Philippines, the Pope meets a joyful behemoth – a national fold boasting 10 million more souls than its Stateside counterpart... and yet, as recalled last week, all of two cardinal-electors. Indeed, since the Pinoy Church was finally given home-grown leadership after four centuries of Spanish and six decades of American oversight, global Catholicism's third-largest outpost has seen just eight of its own receive the red hat. [T]he sickness of accumulating possessed us so quickly. Money got stuck in our hands instead of sliding to the needy. The car became a status symbol even for the newly ordained when the chrism of anointing had hardly dried. The recreation became more sophisticated to expensive tourist sites unreached by the working class. We were no longer lacking in food; we were now choosing our food after being initiated into the palate of the filthy wealthy. It is bad for a priest to fall in love with a woman. It is worse if he falls in love with money. Ordination gave us access to church money but that money is not ours to enjoy. Clericalism speaks of privilege, prerogatives, entitlement and special treatment. Clericalism prefers sacristies to the slums. Clericalism is more concerned with embroidered vestments than reconciled souls. When we look back at the history of the Church, Church reform always started with clergy reform. As the shepherds go so the sheep follow. When we lose humility, we lose perspective. When we lose perspective, we also become too reactive. When we become too reactive and possessive and materialistic, we become less effective and less credible as pastors. The loss of humility and the sickness of accumulation in Church ministry can be very costly. 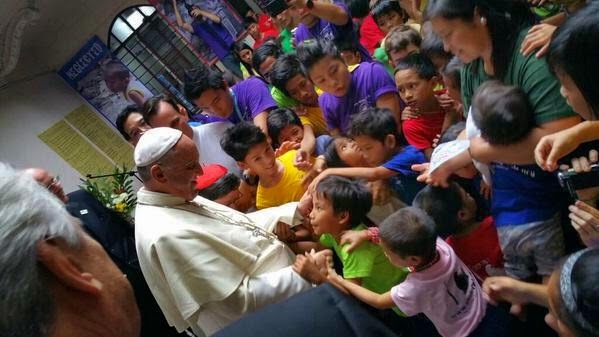 With materialistic clericalism laid aside, and Gospel empowered humble shepherding taking its place, we might be able to see the rainbow of hope in the Year of the Poor. In his last plenary speech to the bishops, meanwhile, Villegas urged the brothers to remember that "most frontal attacks on evil just produce another evil in oneself which is an inflated self image." "Our duty is not to be in the limelight," Villegas said. "Our duty is to be spotlights so that all eyes may see Jesus more clearly and let us help others to see the Lord." Against this kaleidoscopic backdrop – one stretching from exuberant popular piety in packed streets to continued suffering in the wake of 2013's Typhoon Yolanda (whose survivors Francis will visit Saturday), and the faces of the rescued orphan street-kids he met in an unscheduled stop (above) – this morning the figure who's come to be known locally as "Lolo Kiko" (roughly translated, "Grandpop Frankie") rolled into the walled village of Intramuros, Manila's original Spanish settlement, for a Mass with priests and religious in the capital's cathedral (fullvid) that powerfully displayed the twin vital threads of Pinoy Church: a reverence for tradition, and the vibrant emotion that keeps it alive and magnetic into the present. Featuring some remarkable ad-libs in what he's long termed his "toughest" language to master, the homily was given in the Pope's rapidly-improving English. 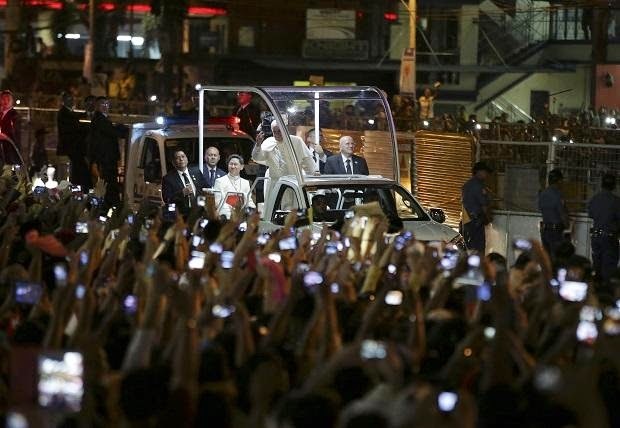 As few parts of this Church can do that better or more powerfully than the Pope's hosts over these days – a million of whom lined the streets just for last night's ride from the airport – get ready for quite the weekend... and if the tropical storm currently tracking toward the islands indeed hits, well, God help us.